As for fortified eggs from hens whose feed is enriched with extra omega-3 fatty acids-- a fat that is good for your heart, your brain and your joints -- they may not be all that they're cracked up to be. Lab tests commissioned by the Center for Science in the Public Interest found that some of the eggs, said to have come from hens that had eaten feed rich in omega-3s -- contained less of the beneficial fat than advertised. This was shocking to me as I have been using (a lot) of these high omega 3 eggs in my baked goods. They do cost more & I have been passing that cost to my customers believing that I was baking a healthier product. So it sounds to me after doing more reading that they need to do some more studies before it can be proved that high omega 3 eggs are better for you. 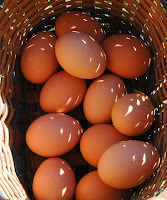 I have been buying most of my eggs from a local vendor at the market. His chickens are truly cage free (or pastured) & are treated more like pets. So I'm supporting the local economy, getting a great fresh product, and the chickens are very happy. It seems to me that happy free range chickens would produce healthier eggs than conventional chicken "farmers" who stuff the chickens in little cages, feed them hormones & antibiotics to keep them producing. A 1999 study by Barb Gorski at Pennsylvania State University found that eggs from pastured birds had 10 percent less fat, 34 percent less cholesterol, 40 percent more vitamin A, and four times the omega-3s compared to the standard USDA data. These studies are enough reason for me to pay a few more dollars per dozen eggs.